The Carpathian English Walnut tree the scientific name (Juglans regia). Carpathian English Walnut is a member of the family Juglandaceae and also called the Persian walnut. It bears seeds that are referred to as walnuts. Just like the other walnut species, the Carpathian English Walnut is a deciduous tree that sheds leaves in the course of the year. It measures about 50 to 90 ft (15.3 to 27.4 meters) in height. Its leaves are pinnate. The genus from which the Carpathian English Walnut comes from consists of 21 species which range from the southeastern part of Europe all the way to the eastern part of Japan. There are also species of this tree that are found on the south eastern region of Canada all the way to California and parts of Argentina. The Turkish and Baklava cuisines have the Carpathian English Walnut as their main ingredient. This species is usually cultivated for both timber and nuts. They are widely grown in temperate zones and are light-demanding in terms of their growth requirements. They are hardy and resistant against drought. 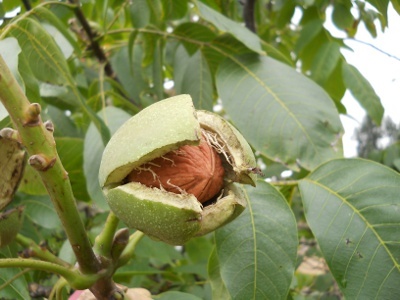 When you grow the Carpathian English Walnut for its nuts, you need to be careful so that you pick cultivars that show compatibility for pollination purposes. There are some which are labeled as self-fertile. The problem with the self-fertile varieties is that they do not fruit better compared to the cross pollinated varieties. The Carpathian English Walnut blossoms in spring around the same time as the sprouting of the leaves. The leafless shoots of the previous year become the surface upon which the male cylindrical catkins grow. The flowers are large in number but smaller in size. Female flowers on the other hand appear in a cluster format at the peak of the leafing season. The fruits produced by the walnut are referred to as pseudodrupe meaning (drupe-like nuts). The outer covering of the Carpathian English Walnut fruit is an involucres. The nut kernels are edible and vary in size from one species to another. If you are looking for a place to plant your Carpathian English Walnut tree sapling, look for a good sunny place to plant you tree. Carpathian English Walnut trees do not do well in the shade. If you are planting other trees use the spacing of 25 to 30 feet (7.6 to 9.1 meter) for growth. A good pH for the soil, is between 6.0 and 8.0, you can bye a good soil meter on line. Make sure your saplings are water daily or every other day, depending on how wet the soil is around the saplings, until your tree is about two years of age. As soon as the Carpathian English Walnut Tree looks like it has good growth in the soil, when it is two years of age you can water you tree once a week if rain fall is not ample. Fertilizing your Carpathian English Walnut Tree in the spring is a good idea. Also placing mulch around the tree about 9 inches (2.5 cm) for growth, do not put the mulch against the tree. Proper mulch keeps the moisture around the roots and weed growth down. Prune the Carpathian English Walnut tree in late fall or late summer. When the nuts fall on the ground collect the ripe ones or if ripe knock the nuts out of the tree with a pole for use, the ones that are not ready will stay on the branches. Nut production can go up to 100 years. Walnuts are very healthy food. Rich in protein and Omega-3 fatty acids. A recommended daily serving of walnuts is a 1/4 cup, it contains 4 grams of protein per serving. Walnuts are rich in poly unsaturated fat and monounsaturated fat.